dfl2 is a GUI library for Windows,now it can be built by dco, DUB or Visual Studio .NET(such as VS 2010). 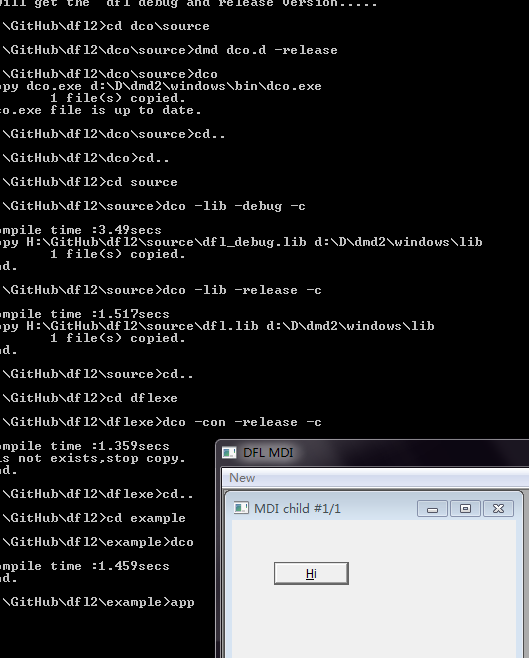 dfl2 is a GUI library for windows,which is based on D2 ,now D2.067b1. user32.lib ole32.lib oleAut32.lib gdi32.lib Comctl32.lib Comdlg32.lib advapi32.lib uuid.lib ws2_32.lib. 1、dfl can be build by dco,and can get the 64 bit version. 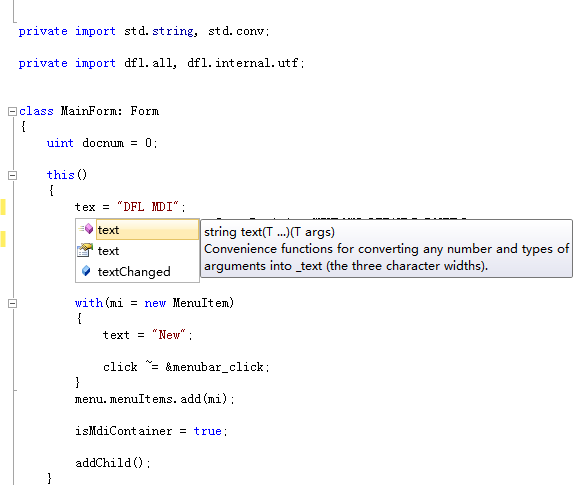 2、dfl can be used in Visual Studio .net (here VS 2010)， whose intellisense will help you very well(to look at the Screenshot),now it can debug in VD 0.3.39. You should copy the 'dfl2\source\dfl' folder to your 'dmd2\window\import'(if not exists,create it),and add importpath to sc.ini (after 'DFLAGS=', add "-I%@P%....\windows\import"). 3、Open the dfl.sln, and run the projects to get them in 'debug' folder and 'release' folder(Now,auto copy to the '$(DMDInstallDir)windows\lib' OR 'bin' folder ). note: If you want to get the release version ,use dcobuild.bat. or vs2010 please.